State Street Global Advisors dropped one of 2017’s most memorable campaigns on Wall Street’s doorstep, opposite the famous Charging Bull sculpture. The campaign, which launched on the eve of International Women’s Day, represented a watershed moment in State Street’s more than 225-year-old history. The statue of a little girl staring down the bull sent social media into rapturous praises — with no shortage of pushback — by co-opting the storied space with a bold, clear statement: support women in leadership posts and stand for the future. 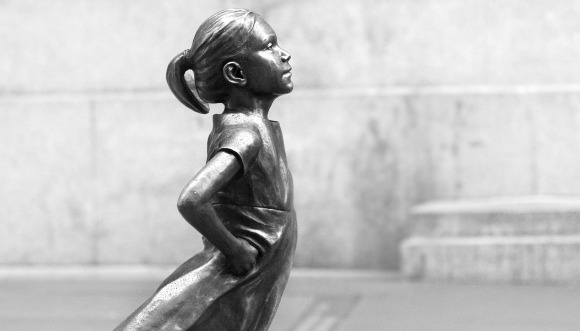 Fearless Girl is an example of what happens when brilliant creativity meets strong strategy in the age of social media and earned media’s resurgence. In addition to the massive amount of earned and social exposure Fearless Girl accrued, the campaign drove business results for State Street’s Gender Diversity Index ETF, traded as SHE on the Nasdaq. The SHE fund saw a 384% increase in average daily trading volume in the days after launch. As of press time, it has $321 million in assets. The Wall Street Journal reported that inbound calls from prospective institutional investors rose 15-fold in the four weeks after the launch, compared with the two weeks prior. And not only did it turn the site into a selfie hot spot, it also reignited conversation around corporate America’s gender diversity issue. It is easier to produce and distribute a lethal weapon than a teddy bear. The Illinois Council Against Handgun Violence created the Teddy Gun to highlight the lack of gun regulations by contrasting them with the extensive safety measures required to create a children’s toy. 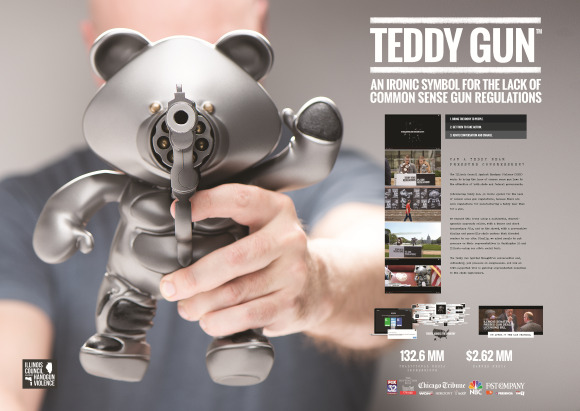 The campaign involved a teaser and short documentary film online and guerrilla-style posters on the street that directed people to the Teddy Gun website. The irony encouraged thoughtful conversation about the need for federal oversight and drove people to take action by providing contact information for local representatives. The council achieved significant impact with a new gun dealer licensing bill passed on April 27. The Teddy Gun exhibit is also touring and impacting communities beyond the launch. 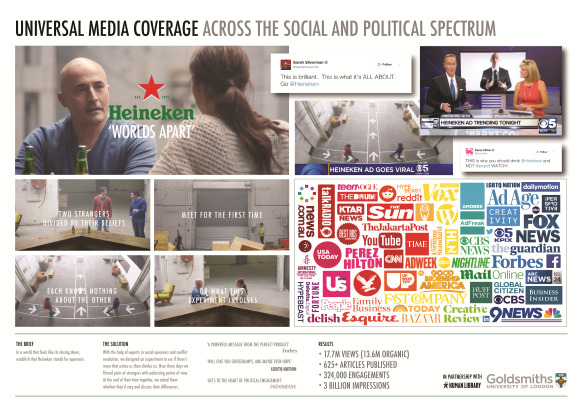 In an overly polarized political climate, Heineken set out to see if there’s more that unites us than divides us. The Worlds Apart experiment paired strangers together. They were meeting for the first time, each knowing nothing about the other or what Heineken’s experiment involved. Unaware of their opposing viewpoints, they were asked to collaborate in constructing a bar. Next, the strangers were shown videos of their partner voicing their strong opinions and were given the option to leave or discuss their differences over a beer. The strangers opted to have a discussion, proving that even people with the most divisive perspectives can be empathetic toward one another. The experiment was designed with the help of experts in social openness and conflict resolution. The video received 17.7 million views, and 13.6 million were organic. There were over 625 articles published about the campaign. The Bank of Aland identified that the Nordics have the highest usage of credit card transactions. 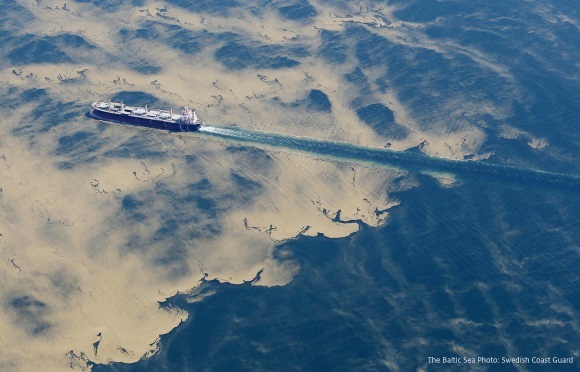 The area also has a dying Baltic sea. To counteract the carbon dioxide impact of every transaction, Bank of Aland created the Baltic Sea Project and Aland Index to provide consumers with a monthly report that measures the carbon dioxide impact of their spending and offers local, global, or lifestyle changes to offset their carbon footprint. The bank made the innovation available for clients and competitors. The campaign increased brand awareness by 308% and accounts for the Bank of Aland increased by 4.4%. The campaign is now a mandatory case study at the Stockholm School of Economics. The initiative was endorsed by the Swedish Minister of Financial Markets and Consumers. 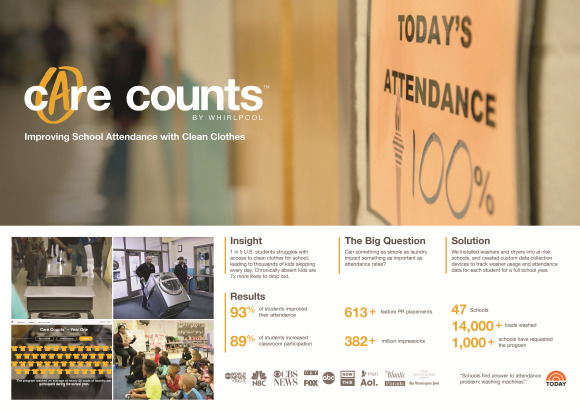 Teachers across the country noticed a correlation between students who struggled with access to clean clothing and absenteeism. Whirlpool tried to figure out if something as simple as laundry could impact attendance. Along with its agency partners, the company created the Care Counts program, offering students access to washers and dryers at school. This is a major issue in the U.S., where one-in-five students struggle with access to clean clothes for school. The program resulted in 93% of kids attending school more often with an increase of 89% in classroom participation, as well as improvement in grades and levels of motivation. The campaign had more than 613 feature placements. Ketchum and DigitasLBi also teamed up with Teach for America to help Whirlpool extend the program to 10 districts and 58 schools. Additionally, 1,000 schools have reached out to learn more about the program. Inspired by an Instagram trend, Cheetos and its agency partners set out to fuel consumer engagement by encouraging people to look into a bag of Cheetos and see what shapes they could find. 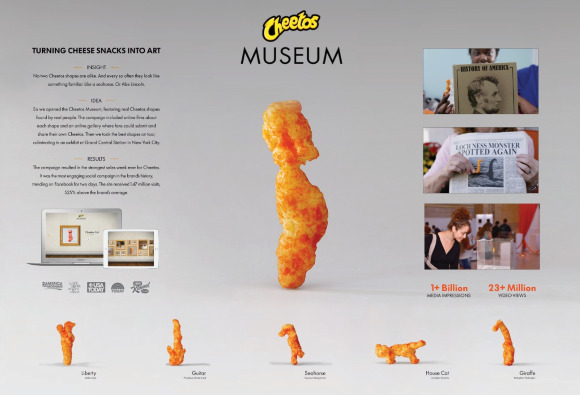 The brand created a Cheetos Museum microsite that allowed consumers to view, vote on, and submit their own shapes for a chance to win cash or other prizes. It was so successful the brand created a pop-up exhibit at Grand Central in New York for 40 of the most distinctive submissions. More than 100,000 submissions were entered and related video content received more than 23 million views. In June 2016, the Cheetos website received 1.47 million views, 525% above the brand’s monthly average. The campaign resulted in 4,831 media placements. Cheetos recorded its strongest sales week ever during the campaign.